Does anybody know what year it is?! I thought it was 2011, but according to Michael Schenker’s new album “Temple of Rock” it’s still 1989!! What was originally planned as a new group called “Strangers In The Night” featuring Schenker/ Pete Way/ Herman Rarebel / and Michael Voss ended up as just a michael Schenker solo album. Still this album rocks like nobody’s business and show’s the guitar god pumping out his best work since the Robin McCauly days! Top Notch guitar work and big attitude rockers! Most of the albums vocals are handled by singer Michael Voss, who does a tremendous job and seems to have a vocal style similar to that of Eric Marten from Mr. Big, but we are also treated to cameos by former Rainbow singer Doogie White and my favorite former MSG vocalist Robin McCauly who performs in my opinion the stand-out track on the album! 1/2.) Intro / How Long– A spoken word intro by the immortal William Shatner on the man’s follies of war lead’s into the first track “How Long” and it’s a doozy! Big Heavy Guitars and pounding drums! Continues on the follies of war concept. 3.) Fallen Angel– Big Attitude Rocker!! Showcases the great guitar melodies the Schenker does better than anyone! 4. )Hanging On– Slow building but then hits you like a punch in the Gut!! Huge Arena Rocker! 5.) End Of An Era– Hard and Heavy right out of the gate and never lets up!! 6.) Miss Claustrophobia– The first single from the album and more heavy guitars but mixed with lots of melodies as well. Huge Chorus! 7.) With You– Slows the pace a little, not a ballad, but very bluesy. Michael’s brother Rudolph Schenker plays rhythm guitar. Very Scorpion-ish track. 8.) Before the Devil Knows You Dead– Very symphonic and reminiscent of Rainbow’s “Stranger In Us All” album which Doogie also sang on. 9.) Storming In– Slow building intro picks up a bit with the first verse and knocks the wind out of you once you hit the chorus!! 11.) Saturday Night– Exactly what you would expect from the title… Big Party Anthem!! Originally released last year as a song by planned super-group called “Strangers in the Night” whose members make up most of this album. 12.) Lover’s Sinfony– My personal favorite track which features for MSG vocalist Robin McCauly. Great Melodic hard rock. Wish he was back full time! 13.) Speed– More big heavy attitude! 14.) How Long (3 generations Guitar Battle Version)– Extended version of track 2 featuring extended guitars solo’s by Schenker w/ Leslie West and Michael Amott! Definitely the surprise of the Year!! 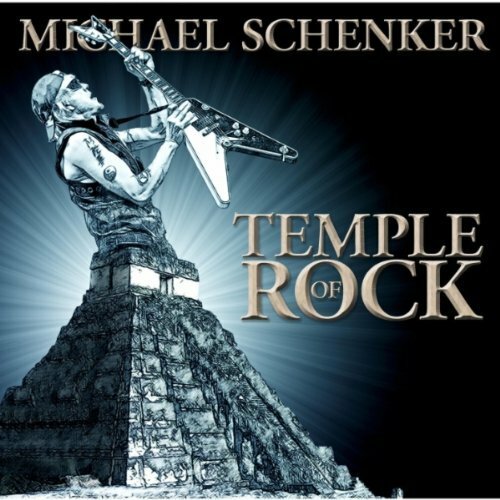 Just when you thought Michael Schenker’s best work was behind him he releases a mind blowing rock album like “Temple of Rock” and cements his guitar god status!! Well done! !